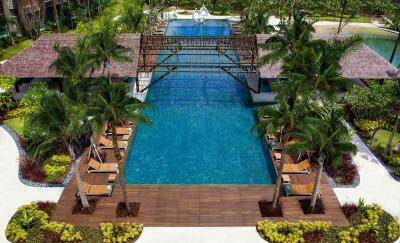 Lock in a great price for Mövenpick Resort & Spa Jimbaran Bali - rated 9.1 by recent guests. Staffs are super friendly, convinience, nice room. This is a great place to stay. Great service, a fantastic room and good amenities. The spa was excellent as well. Our check-in was smooth and everything was enjoyable. The chocolate happy hour was a bonus as well! The location is good for getting around Bali either to/from the airport and also for day trips to other areas. It was a pleasant stay with perfect customer service. Two thumbs up for Anjani who looked after us from when we arrived all the way til we leave for airport....travelling with two little ones became easier and much more convenient with her help. Thank you Anjani!! Family room was excellent, great size & the kids loved the little kiddie touches (kids slippers, kids sized robes, water bottles etc. Staff throughout the resort were polite & efficient. Only 18 mins door to door from airport - so convenient. the facilities especially the large swimming pool is real surprise to us. particularly mentioned is the kids water features and the sand in the swimming pool! that lovely! Everything. Pools were awesome. The staff esp Kiki were amazing. The location is only 5 minutes walk to Jimbaran beach and 10 minutes walk to seafood Jimbaran. Excellent resort to spend time with your family, kids will surely love the kids pool and spacey playroom. So many perks for kids, perfect for a relaxing holiday travelling with kids. One of our top picks in Jimbaran.Boasting 4 different outdoor pools, Mövenpick Resort & Spa Jimbaran Bali is set in Jimbaran in the Bali Region, 100 yards from Jimbaran Beach. 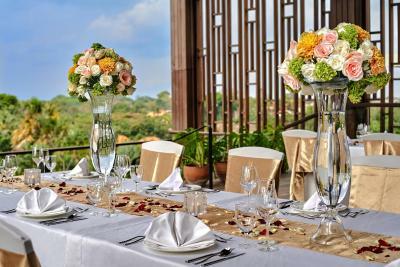 The family resort has a spa centre, a fitness centre, 5 dining outlets and 7 venues for meetings and events. Guests enjoy free daily chocolate hours and free minibar upon arrival. Mövenpick Resort & Spa Jimbaran Bali is 4.8 miles from Balangan Beach and 5 miles from the nearest airport, Ngurah Rai International Airport. This is our guests' favourite part of Jimbaran, according to independent reviews. This property also has one of the best-rated locations in Jimbaran! Guests are happier about it compared to other properties in the area. 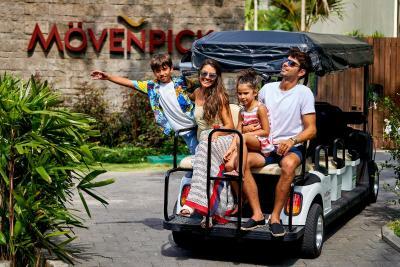 Mövenpick Resort & Spa Jimbaran Bali has been welcoming Booking.com guests since 23 Nov 2016. When would you like to stay at Mövenpick Resort & Spa Jimbaran Bali? Overlooking either Jimbaran Hill or the tropical garden, this twin room has air conditioning, a flat-screen satellite TV and iPod dock. The 4-fixture bathroom is stocked with slippers, bathrobes and free toiletries for extra comfort. Offering views the the multi-level swimming pool and the tropical garden, this double room has a private patio/balcony and a 4-fixture bathroom. Slippers, bathrobes and free toiletries are provided for extra comfort. 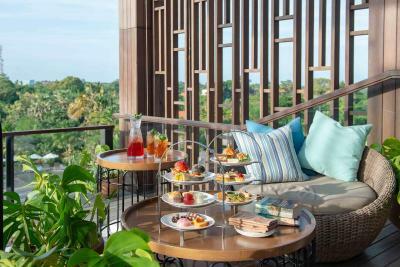 Boasting panoramic views of Jimbaran Bay, the swimming pool or the garden, this suite has a private balcony, a separate dressing area and a 5-fixture bathroom. It's equipped with a minibar, a coffee machine and ironing facilities. Offering views of the tropical garden, this family room is suitable for up to 4 persons with a king-sized bed and a sofa bed. En suite bathroom is stocked with a hairdryer, slippers and free toiletries. 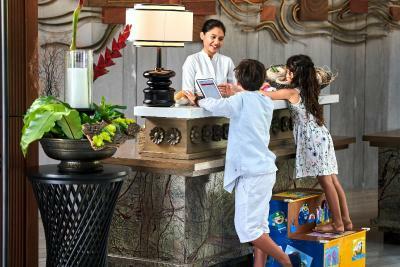 Guests enjoy complimentary access to the Kids Club. Offering views of the swimming pool, this family room is suitable for up to 4 persons with a king-sized bed and a sofa bed. En suite bathroom is stocked with a hairdryer, slippers and free toiletries. 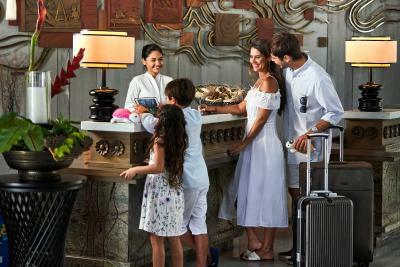 Guests enjoy complimentary access to the Kids Club. Offering views of the swimming pool, this suite has modern interiors, a private balcony and a 5-fixture bathroom. Slippers, bathrobes and free toiletries are provided for extra comfort. Boasting panoramic views of Jimbaran Bay, this spacious suite features a private pool, a private balcony and a separate seating area. En suite bathroom is stocked with a hairdryer, slippers and free toiletries for extra comfort. Overlooking either Jimbaran Hill or the tropical garden, this double room has air conditioning, a flat-screen satellite TV and iPod dock. The 4-fixture bathroom is stocked with slippers, bathrobes and free toiletries for extra comfort. Offering views the the multi-level swimming pool and the tropical garden, this twin room has a private patio/balcony and a 4-fixture bathroom. Slippers, bathrobes and free toiletries are provided for extra comfort. 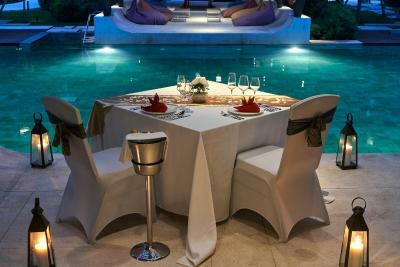 House rules Mövenpick Resort & Spa Jimbaran Bali takes special requests - add in the next step! Mövenpick Resort &amp; Spa Jimbaran Bali accepts these cards and reserves the right to temporarily hold an amount prior to arrival. Mövenpick Resort & Spa Jimbaran Bali accepts these cards and reserves the right to temporarily hold an amount prior to arrival. 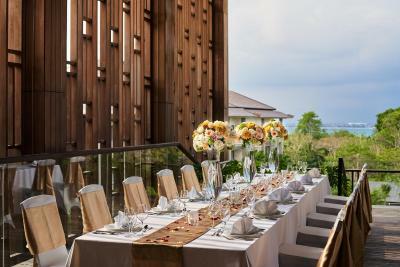 Please inform Mövenpick Resort & Spa Jimbaran Bali in advance of your expected arrival time. You can use the Special Requests box when booking, or contact the property directly with the contact details provided in your confirmation. The Hotel property is clean - staffs is helpfull and polite Toilet/Rest room in the Lobby are clean - this is most important for our family. Thanks for these. Movenpick is amazing!! Can’t wait to stay again!